Are you excited yet? One week until Solo: A Star Wars Story hits theaters! In 2015, we got something I never thought we’d get: Another chance to see Harrison Ford as Han Solo on the big screen. His performance as Han in The Force Awakens was the highlight of the movie for me, and I really enjoyed it. Unfortunately, it would be the end of Han’s journey (hey, it’s been 2.5 years. If you haven’t seen it by now, that’s not my fault). 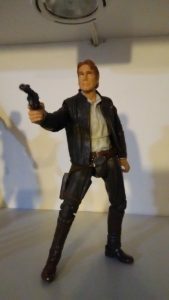 Here’s Hasbro’s representation of Han from The Force Awakens. It might be Hasbro’s best sculpt of Harrison every. I’ve seen some repaints of this that look REALLY good.